The iPhone 4S is official, which isn’t too surprising considering the release date and name was leaked by Apple Japan prior to the Apple event. Nonetheless it’s a big update in terms of specs, so here’s what we know. While the exterior looks identical to the iPhone 4, the interior is quite a bit different with significant upgrades. 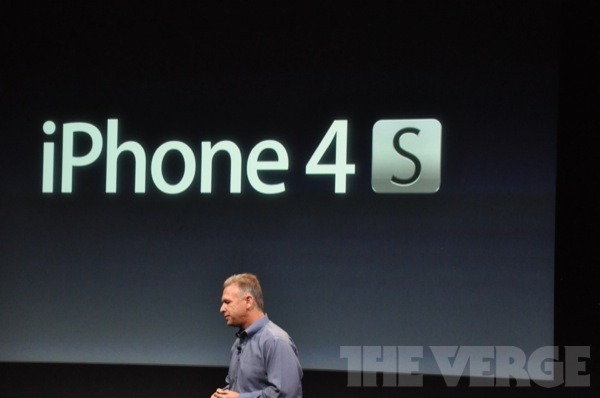 As before, iPhone 4S will be available in black and white, and offered in variety of sizes, including 16GB and 32GB, and new to the 4S, 64GB. The screen size and resolution are the same as existing iPhone 4, as well as the dimensions of the device. That means your existing iPhone 4 cases and screen shields should work just fine with the iPhone 4S. Ready to upgrade? Check your iPhone upgrade eligibility with AT&T, Verizon, or jump on over to the new carrier, Sprint. Let’s face it — the Apple announcement was a DUD. It was a disaster. After months and months of drama of suspense, intrigues, rumors, and so-called property security breach it was really to boost Apple’s stock value so much so that when the DUD is finally announced, enough buffer line will cover the decline of Apple’s market value. It’s true!! The market’s response WAS REALLY NASTY. I’m sure Samsung is laughing hard right now. Eat your heart out Apple loyalist!! L-O-S-E-R!! What is the point of your post? You have an Android phone and it doesn’t even look like any update would have got you to switch over. Also I highly doubt Samsung is laughing. Now the iphone is on all three carriers, as well as a “cheap” option if you want to get the iphone 4 or 3GS. Well, you and Charlie Sheen can go right on “winning.” I (and many others) am glad not to have you in my camp. I look forward to getting my iPhone 4S. Apple stock is now above where it was before the announcement…it ALWAYS drops after announcements – that is how stock markets work, people buy on and sell around the announcements to make short term gains. Wonder if a Verizon iPhone 4S will be a true world phone? does anybody know how much RAM on the 4S ?